ADD UPDATE, 14 December 2016: Eastleigh Borough Council (EBC)’s recently released infrastructure report on the viability of options for its Local Plan raises some very serious practical concerns regarding the planned new road essential to the viability of options B and C. As readers know, this road would run from Mortimers Lane in the east towards the M3 in the west, squeezing under the Allbrook railway bridge along what is now the Highbridge Road. 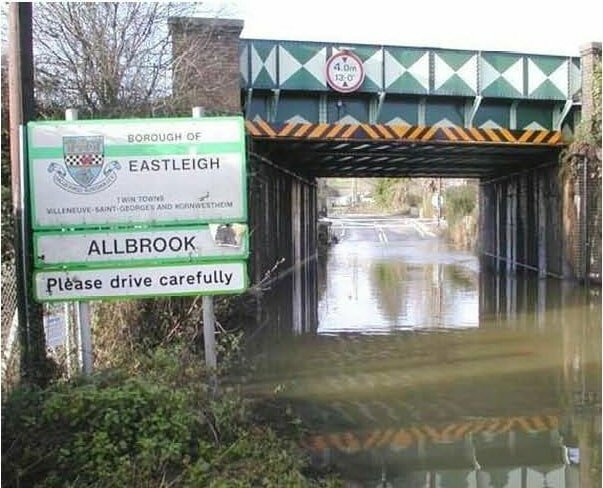 Amongst the sea of concerns, the report highlights several problems with the tiny Allbrook railway bridge, which – if the new road is built – would need to accommodate an estimated 30,000 extra daily car journeys resulting from the proposals’ 6,000+ new houses. Although another EBC paper identifies (p.13) the need for “further technical investigation, including investigation of alternative strategies” for dealing with the constraints of the bridge, the problems seem so large that no amount of additional investigation will ever provide a solution. Rather, it will simply waste both time and taxpayers’ money. As regards the vertical alignment, just how much can the road be lowered on the eastern side of the bridge without impacting the Itchen Navigation? The water level in the Itchen Navigation on the south side of the road, and under the road bridge itself, appears to be roughly the same height as the road surface level under the railway bridge. The Itchen Navigation road bridge and the railway bridge are very close to each other so – if lowering the road is possible – a new road bridge would also be required (and one that somehow still allows fish to access the fish ladder in the old lock on the north side of the road). Moreover, to add to the folly of this harebrained scheme, it’s worth remembering that to close the Itchen Navigation – something that would be virtually inevitable to carry out this kind of work – requires an act of parliament! Local residents don’t need to be told that using the towpath, as suggested, would be a most unattractive, and even dangerous, option, particularly at night time. Only a few years ago, the murderer of poor Georgina Edmonds at Brambridge was believed to have used this towpath route, and it was not far from here, while walking along this towpath, that a 21-year-old student called Joan Lesley McMurray was murdered in 1969. So the statement that people would still prefer the current route under the railway bridge, in full view of passing traffic, is very well founded. This is the route that most people will continue to take – with or without the pavement. 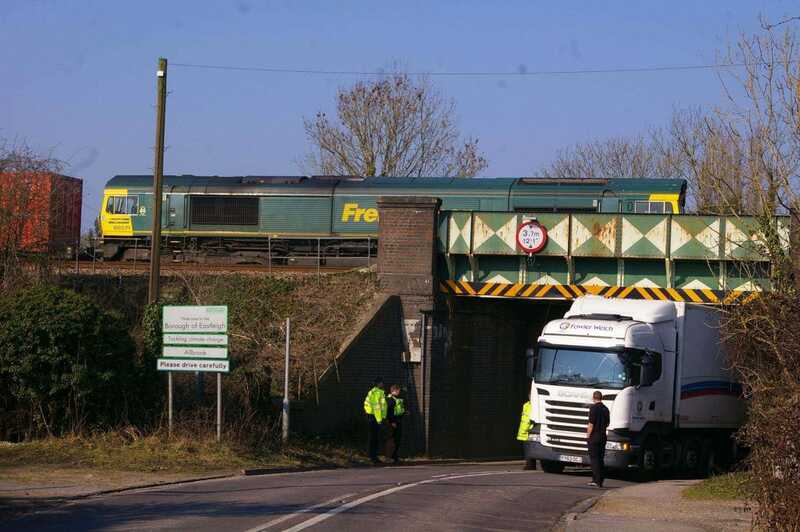 Page 16 also refers to 18 incidents of “bridge strikes” – oversize vehicles hitting the railway bridge – since 2008. What the report omits, however, is any mention of the number of times an oversize vehicle has to stop short of the bridge and turn around, often causing serious traffic problems and needing police intervention. While additional signage may reduce this problem, it is unlikely to stop it completely (as we know from the failure of lorry drivers to adhere to road signs for the Chase development in Bishopstoke). With huge increases in traffic, further road alterations would be needed to allow errant vehicles to turn around quickly and safely. These are only a few of the many reasons why options B and C are so unsuitable. As we have said before, not only are they the most environmentally damaging of EBC’s options but they also offer no prospect of linking to a sustainable public transport system. They will therefore – without doubt – generate huge additional traffic congestion for the whole area. EBC’s failure to get the Planning Inspector’s approval for its previous Local Plan must have been an expensive mistake, although a Freedom Of Information request to “estimate the cost of the Draft Local Plan rejected by the Inspector” was side-stepped. Now history is being repeated with the council pursuing another inappropriate plan that will, in all likelihood, be similarly rejected by the Inspector, wasting huge additional sums of taxpayers’ money. Unsurprisingly, local residents are, in their thousands, scratching their heads as to why Keith House, the Lib Dem leader of the council for over 22 years, seems so determined to find ways to overcome the clearly insurmountable problems associated with options B and C, whilst at the same time being unprepared to make any effort to address the relatively few issues associated with the alternative proposals in Allington Lane (options D and E). Would it be disingenuous of us to think that this has something to do with the fact that supporting the Allington Lane proposals would place a large development next to the ward that elected him and might put his re-election in jeopardy? Let’s hope not. Nimbyism is unattractive at the best of times but in our leaders it is both destructive and dangerous. 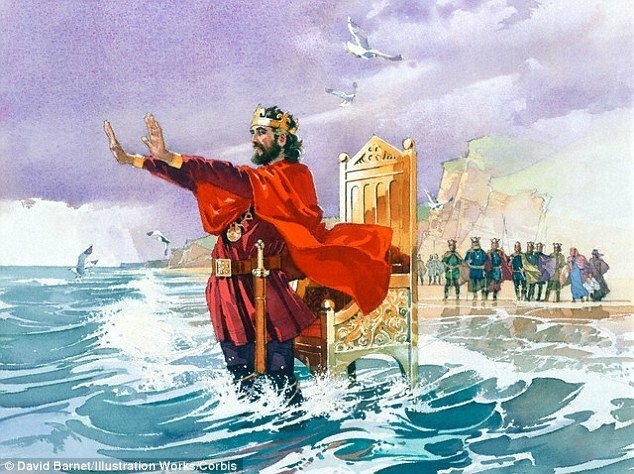 In the face of all the evidence so far, at least we can take solace in what happened to King Canute. This deluded monarch’s spectre currently looms large at EBC’s headquarters!